Danny Kaye was more than just a movie star; he was an entertainer in every sense of the word. With talents that ranged from comedic improvisation, dancing, singing, musical composition, and a unique and often hilarious ability to recite complicated verse without so much as a hitch, it’s no wonder that he went on to become one of the greatest American entertainers of all time. 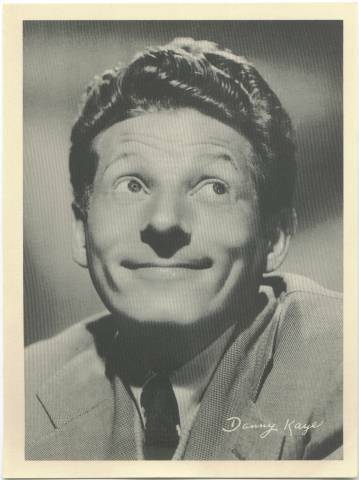 Danny Kaye, the son of an immigrant Russian tailor, was born David Daniel Kaminsky in Brooklyn, New York on January 18, 1913. Upon dropping out of school at age 13, he found his first work in the entertainment business with a radio station in the Catskills. From there he began working the small theaters in the then called “Borsht Belt” area, honing his comedic style alongside other performers like Dave Harvey and Kathleen Young in vaudeville shows. By the late 1930s Kaye had built up enough of a following to began performing on his own - often with material written by his soon to be wife, Sylvia Fine. His successes on stage and in nightclubs led to roles in a few two-reel movies for Educational Pictures, “Dime a Dance”, “Getting an Eyeful”, and “Cupid Takes a Holliday”. However it was his Broadway debut in “Straw Hat Revue" in 1939 that earned him his first real recognition. On the heels of that big break Kaye married Sylvia Fine, who went on to manage his career, and won over the Broadway crowd with his rip-roarious singing in "Lady in the Dark" (1940), in which he rattled off more than fifty names of Russian composers in the tongue twisting song "Tchaikovsky.” It was this role that caught the attention of movie agents and none other than Samuel Goldwyn, who went on to ink Danny to a $150,000 per film deal – really big money at the time. 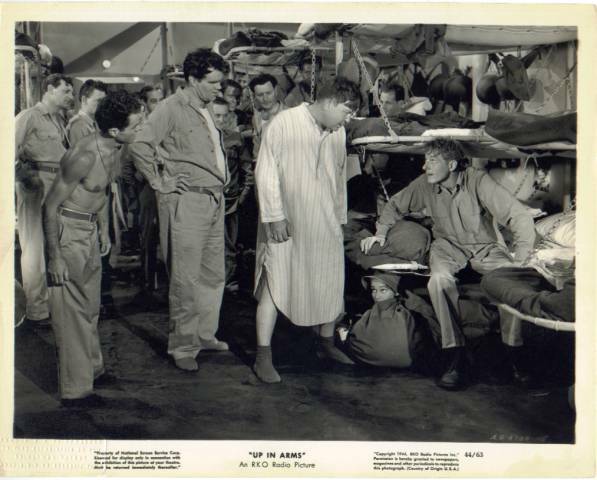 Kaye made his first feature length film “Up in Arms” (1944), which met great success and displayed his ability to deliver witty songwriting and comedic timing with the best of them. His next film, “Wonder Man” (1945) the first of three films in which he played double roles, was another hit. The movies that followed all but solidified his standing as one of the emerging comedic geniuses of his time: “The Kid From Brooklyn” (1946 remake of Harold Lloyd’s “The Milky Way”), “The Secret Life of Walter Mitty” (1947, arguably his best role), and “A Song Is Born” (1948). He starred in the classic “The Inspector General” (1949), and “On the Riviera” (1950) under a different producer but then returned to Goldwyn to play the lead role in the biography, “Hans Christian Andersen” (1952). Kaye then left to film under his own production team with Norman Panama and Melvin Frank as writers/directors. These features wound up being his biggest hits of all: “Knock on Wood” (1954), in which he plays a ventriloquist caught up in international espionage, and the ever popular Robin Hood parody “The Court Jester” (1956) which includes the hilarious dialogue, "The pellet with the poison’s in the vessel with the pestle, the chalice from the palace has the brew that is true." He was also the last minute replacement for Donald O’Connor in the 1954 smash hit, “White Christmas” with Bing Crosby. In 1954 Kaye began his long humanitarian tenure with the United Nation’s Children’s Fund (UNICEF). His work toward social responsibility earned him a special Academy Award for his work. Kaye continued to work in the movies showing his range as an actor in the dramatic musical, “The Five Pennies” (1959, in which he played a troubled clarinet jazz musician and even had a duet with the great Louis Armstrong). In 1963 he began his own television variety show, “THE DANNY KAYE SHOW”, which ran for four years and was an enormous hit, winning an Emmy in its first season. Though Danny’s popularity waned during the 1970s and 1980s, he continued to be an active philanthropist of UNICEF, and appeared in their short film, “Pied Piper”. Of his many charitable performances, his work for symphony musicians' pension funds was the most popular. He raised more than ten million dollars by performing benefit concerts. In one of his final performances, Kaye proved the versatility of his talent and earned rave reviews for his impassioned portrayal of a Holocaust survivor in the 1981 television move “Skokie”. He also had a guest appearance on television’s famous “Cosby Show” in 1986, where he played the sidesplitting role of Dr. Burns. The following year (1987), Kaye died of a heart attack in Los Angeles, California. Throughout his life, the incomparable Danny Kaye entertained millions with his quirky brand of comedy. He was equally amazing as an actor, singer, dancer, and humanitarian. Off stage Kaye was a man of talent as well, where he was one of the original owners of the Major League Baseball Seattle Mariners team, a celebrated chef, and an airplane pilot. It was his intelligent humor that won the hearts of his fans and his genuine love of his fellow man that still endears him to people all over the world. M. J. Goodner, an ordained minister, is the author of the science fiction novel, Nargasaan Prophecy, ISBN - 1411603435, Lulu Press. Visit http://mjgoodner.tripod.com for more info. Watch for movie star profiles such as this in every issue of The Movie Profiles & Premiums Newsletter.